In Provence in the south of France, Jean Bernard and Nathalie Masset have created a terrace to marry well with their seventeen century home. The Massets have added accentuating details that might go unnoticed to the eye because they correspond beautifully with the surroundings. Note the railroad tie border around the terrace, and the old cut stones around the tree. material for drapes? - I love the heavy look of these drapes... what is the material? Everything in the photo is a French antique sourced by Jean and Nathalie Masset from Apt France. The linens are old bedsheets.the photo is a French antique sourced by Jean and Nathalie Masset from Apt France. The linens are old bedsheets. Curtains - The question remains unanswered. What material are they made of. Looking for rods like these that are rust free. Any ideas? furniture question - I was wondering what company makes the furniture in this particular patio photo, but I do not know how to distinguish ithat photo from another. It is an outdoor view with the wood sofa with white or light tan deep cushions facing a gas enclosed fire place with a chair and greenery around on a large and small concrete tile flooring. Outdoor curtains billow in the wind and add a touch of romance to even the simplest space. They can also do double duty by keeping bugs at bay. Create an al fresco dining destination. This outdoor dining space is reminiscent of a French café. With gravel and stone covering the ground and hefty iron furniture, the floor-pooling white curtains provide a welcome note of softness. Curtains can help filter out sunlight on the sides too. Flowing fabric delivers a soft, elegant touch to any outdoor space while helping to control both sun and shade. 4. Traditional MethodsMosquito netting can look superstylish. Used all over the world, it can serve as a decorative outdoor curtain as well as functional mosquito protection. Outdoor fabric curtains The whimsy of these breezy beauties is reason enough to rig up some alfresco curtains, even if you don’t have an insect problem. 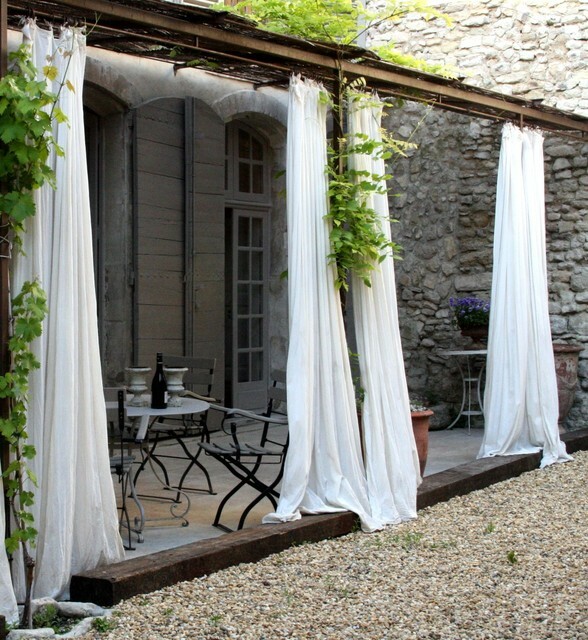 Outdoor curtains like the ones in this French home in Provence come in as many colours, patterns, designs and dimensions as indoor curtains, though the most important consideration is to choose a fabric specifically designed for outdoor use. Many fabrics filter ultraviolet light, so have an added sun protection bonus.